Future of global economy depends on a new crop of anti-establishment politicians. Given their recent track record, that’s not an encouraging prospect. There is a strange sound of relief coming out of the International Monetary Fund. 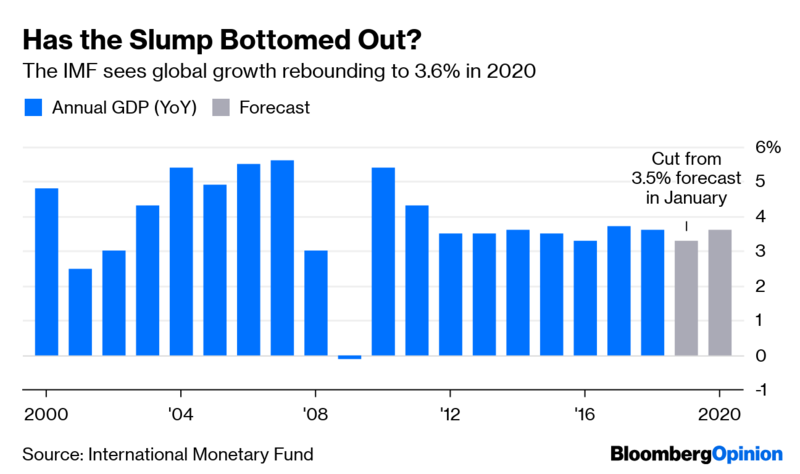 The IMF has slashed its global growth forecasts to the lowest level since the financial crisis, but it also believes policy makers may have stepped in just in time to avoid a turn for the worse. Central bankers deserve credit for pausing on their long road back to a more normal monetary policy. This has helped to bring some calm to financial markets and may help to lift growth in the second half of this year. But it’s illusory to think that the monetary authorities can save the global economy as they did in the wake of the Great Recession. From Europe to the US, if politicians decide to mess things up, there is little to stop them. The IMF cut its global growth estimates for 2019 to 3.3 per cent from 3.5 per cent in January, the lowest level since 2009. The twice-yearly World Economic Outlook notes the sharp slowdown at the end of last year, but forecasts a pick up in the second half of 2019. World output is forecast to expand by 3.6 per cent in 2020, in line with expectations from three months ago. The IMF says the return of central bank accommodation has helped to ease financial conditions. The US Federal Reserve has stopped raising interest rates since December, as there is no sign inflation is overheating in spite of a robust labor market. The European Central Bank in March pushed back its first interest rate rise until at least next year, as it launched a new program of cheap loans to banks. These decisions – however wise – are a sideshow to the real risks facing the world economy. Gone are the days when central bankers were the masters of the universe, with the power to lift the global outlook if only they deployed the right instrument. The election of populist administrations, from the US to Italy, has put politicians back at the center of the economic scene and, unfortunately, not for good reasons. The IMF identifies three main areas where politicians have the potential to do serious harm to the global economy. The first is global commerce: President Donald Trump has already caused havoc in the financial markets with his trade confrontation with China. He is now threatening to do the same with the EU. Trade wars do not just put a brake on the growth of exports, as foreign demand collapses. They also undermine confidence generally, leading to lower business investment. While central banks can ease monetary policy to encourage companies to borrow, this is insufficient so long as uncertainty persists. As the economy slows, the labor market also cools, putting a further brake on internal demand. The second risk relates to a possible no-deal Brexit, which the IMF estimates could plunge the UK into a recession. Here politicians are only partly to blame: After all, Britons chose to leave the EU in a referendum. 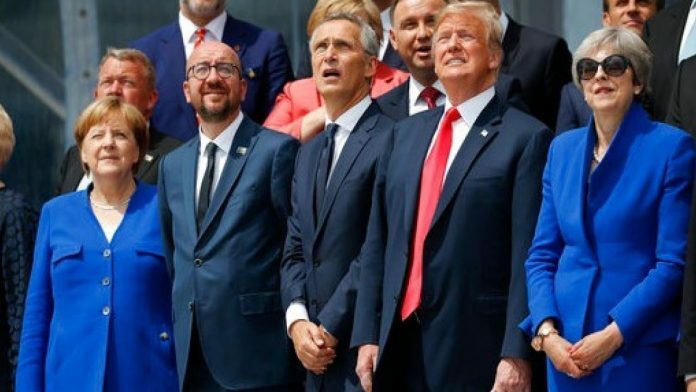 But the nation’s political class has spent the period since the vote dithering and postponing crucial choices, which have pushed Britain beyond the original departing line without a clear plan on what to do. Until a final agreement is found, a “no deal” Brexit is still possible. This has the potential to cause severe harm to the British economy. For example, a sharp increase in trade barriers to trade with the European Union would be devastating, and the Bank of England would have no powers to stop this. The government needs to come up with a credible plan to keep the budget deficit and public debt under control. For now, it continues to rely on a raft of VAT increases for the coming years – but officials also vow this will not happen. If they fail to control their spending instincts, financial markets could react, as they fear for the sustainability of Italy’s 2.4 trillion euro ($2.7 trillion) public debt. The European Central Bank has strict limits on assistance it can provide, and would only be able to offer support if politicians signed up to a program of fiscal restraint and reforms. Once again, central bankers would be able to do little if politicians chose not to play along. The IMF is right to applaud how monetary authorities have stopped a slowdown turning into something worse. But they are talking to the wrong people. The future of the global economy now depends on a new crop of anti-establishment politicians. Given their recent track record, that’s not an encouraging prospect.